If you are a blogger who is following me, you may not know what No Reply is. I didn't know what it was until about a month ago when another blogger kindly enlightened me. When you post a comment on a blog, most Blog authors like to respond to your comment personally. I have already explained how you can connect with bloggers on your own blog by setting up threaded comments. However, not every blog you follow has enabled threaded comments. It is very simple to edit your blogger profile to ensure that your email is visible to other bloggers, so when you post a comment, they can get in touch with you easily and reply to your comment. First, click on design. In the upper right hand corner you will see your name as well as the profile picture you have chosen to appear on your blog. Click on your name and a drop down menu will appear. 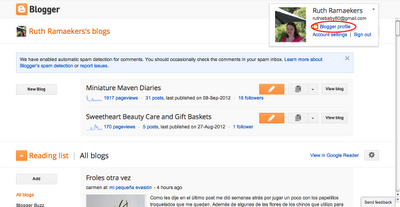 Click on Blogger Profile. This will take you to your Blogger profile page. Click on Edit profile. This is a small orange button which you will find in the upper right hand corner of the screen. 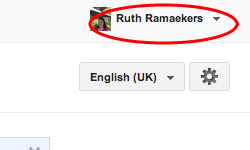 When you get to the Edit user profile page, click on the box next to show my email address. You're done! Ruth - I have just joined you through your comments on Jazzi's new Forever Project. It was your remarks about Freecyclers that encouraged me to contact you and if you read my comments to Jazzi you will understand. I am writing these tutorials because I hate to see really talented miniaturists be limited as to what they can do on their blog simply because blogger does not provide adequate (or any for that matter) help regarding these matters). I'll continue to write more tutorials and I'm glad you're finding them useful! Ruth, I tried to email you but I think Yahoo is being persnickety. Thanks for the No Reply info and its now fixed on my blog. Your tutorials are so useful and easy to follow. Thank you, Ruth. You are the bomb! I just started my miniblog a few weeks ago and am still trying to navigate the ins and outs of blogging. You are right. The Blogger help is not so helpful. You, on the other hand, are. Thank you! Thank you for also sharing these tips on how to use a blog and make the most out of it. They surely are very useful to anybody that is starting blogging.